Sandra Day O'Connor may have officially retired from her esteemed 25-year career as Supreme Court Justice in 2006, but she is still "working" for the courts and our government. Motivated by research she describes as "disheartening" that shows that "only a third of the public can even name the three branches of government... yet two-thirds of Americans can name one of the judges from American Idol," she has taken her crusade to the web, creating a new website, Our Courts ," designed to teach students civics and inspire them to be active participants in our democracy." The Our Courts site offers a wide diversity of resources, including lesson plans and curriculum ideas for teachers to help create a deeper understanding of American government in schools, and interactive features for students such as "Civics in Action" and "Ask the Justice," and a series of online games that she helped design will be launched this summer. At 78, O'Connor is still forward thinking and embracing the latest cutting edge technology, excited by its great potential to educate and empower. I recently had the opportunity to interview the inspirational former Supreme Court Justice about her new web site and other timely topics of the day. Marianne Schnall: Was there any one observation of our society that motivated you to create the Our Courts web site? 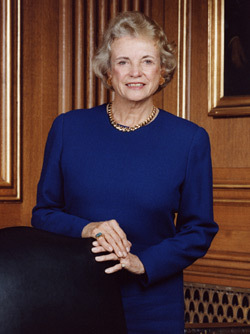 Sandra Day O'Connor: Two observations compelled me to develop Ourcourts.org. First, I was concerned about mounting attacks on courts and judges. I have seen attacks on the judiciary before, of course, starting with the "Impeach Earl Warren" billboard on the highway near the Lazy B Ranch where I grew up. But recent attacks are broader and more vitriolic than any I have seen in my lifetime. That is not to say that judges are above criticism or that people should not voice disagreements with judicial decisions. The freedom to criticize judges and other public officials is necessary to a vibrant democracy. The problem comes when healthy criticism is replaced with more destructive intimidation and sanctions. For instance, when I began the Our Courts project there was a proposal on South Dakota's ballot that judges ought to be jailed for making erroneous decisions. I don't know how a judge can concentrate on being fair and impartial when he or she is faced with possible jail time for making a decision that others deem incorrect. My second observation was that many of these attacks stemmed from a fundamental misunderstanding of the role of the judicial branch of government. In fact, surveys show that approximately 75% of the public cannot distinguish the role of a judge from the role of the legislature. Only a third of the public can even name the three branches of government. Compare that to the two-thirds of Americans who can name one of the judges from American Idol, or the nearly three-quarters who can name two of the Three Stooges, and the numbers are disheartening. Without basic civic education, we cannot expect to preserve or improve our system of government. I hope the Our Courts website will be one small step in educating students about our government, so they will be empowered to effectively engage in civic discourse. MS: Would you elaborate on the importance of the rule of law and the judiciary in our society? SO: The law provides necessary continuity amidst our constantly shifting political landscape. It is an assurance that the rules of the game apply equally to everybody, whether they are in today's or yesterday's majority. Commitment to the rule of law provides a basic assurance that people can know what to expect whether what they do is popular or unpopular at the time. It allows people to order their lives in important ways. It also provides important benefits to society as a whole. For example, we have the right to openly criticize our government in this country, and that has been immensely important to our political stability and growth in the United States. But if the rule permitting criticism of the government was simply disregarded whenever an unpopular view was expressed, then I doubt many people would speak out. MS: What can parents do, in addition to using your web site, to enhance their children's understanding of the great gift of the rule of law and the civic duty of protecting it that they will be inheriting? SO: I think we may be seeing the beginnings of a resurgence of civic-mindedness in this country. Hopefully the younger generations, which came out in record numbers during the last presidential election, will pass their enthusiasm on to their children. Parents should continue to become more involved with their communities, and more involved in their children's education. In addition, they should include their children in their civic activities by bringing them to the polls and to community meetings. If parents instill a sense of civic-mindedness--and there is no better way to do that than by example--their children will probably follow. MS: Is there one important legal issue that is critical for children to understand? SO: The separation of powers and the unique role of each branch of government is what I hope to help young people understand. There are other equally important legal issues, no doubt, but this is a fundamentally important concept, and one that is apparently slipping through the cracks. A recent survey revealed that only about a third of people can even name the three branches of government. So it is unsurprising to hear criticism of the judicial branch for "interfering with" or "obstructing" the other branches. Obstructing the other branches when they break the rules is precisely what the judiciary is constitutionally obligated to do. If the other branches of government weren't sometimes angry with judges, then we wouldn't be doing our jobs. For students, understanding the separate and unique functions of each branch of government can help them understand how different kinds of government officials can help solve different kinds of problems. Someone may have a problem that is easily solved or an idea with great potential, but if he or she doesn't know which branch of government can deal with it, then the issue will go nowhere. Understanding the three branches of government is a critical tool in the toolbox for civic participation and leadership that will help today's students shape the future of our society. MS: Is there one key case that would help elucidate or bring to greater clarity the importance of the rule of law? SO: Brown v. Board of Education is a good starting point. Brown held that segregating public schools on the basis of race was a violation of the Fourteenth Amendment's Equal Protection Clause. It was a very unpopular decision in some parts of our country, and the Justices knew that before they signed their unanimous opinion. But they did what they thought the law required, as did numerous judges in the South who then had the unenviable task of giving effect to the ruling. Unpopular judicial decisions are especially important because the rule of law is worthless if it is only followed when it is popular. We most need the judiciary to uphold the law during times when it is least popular to do so. Another important thing to remember about Brown is that the battle was not over when the decision was issued; it took an executive branch that believed in the rule of law to enforce it. While President Eisenhower's own views on the matter were somewhat ambivalent, he described his duty to uphold the ruling as "inescapable." So President Eisenhower ordered federal troops to Little Rock, Arkansas, to ensure that nine black children could enter Little Rock's Central High School. That event provided one of the most dramatic examples of the importance of the rule of law. MS: What do any of the adults who are connected to children need to understand or educate themselves about in order to help guide our children regarding civic responsibility? SO: We should remember that knowledge of our system of government is not passed on through the gene pool. Each new generation must be informed and inspired to participate. That was the original purpose of our public school system, to train young citizens. We should advocate for an enduring commitment to civics education inside and outside of our schools. Parents, teachers, and concerned citizens should support civics education in the classroom and steer students to resources like Ourcourts.org outside of school. Today's students learn through discovery and self-directed learning more than ever before. Teachers, parents, and other learning facilitators need not be experts in government to help students learn civics, but they do need to be committed to facilitating civic learning and to guiding students to useful resources. MS: Is there any one area of our society (such as health care, financial restructuring, educational systems etc.) that first needs to be addressed so that we can place a greater emphasis on guiding our children into understanding their government and their civic duty more? SO: No. Civic education can and must happen alongside other changes that might need to be addressed. Today's students will determine the future of our society and our institutions, and we cannot wait to educate them about civic participation until we think conditions have been perfected. They will be the ones who will need to take the reigns to continue to perfect our union, and they must be educated to do so. MS: Given that you were only one of the two women in the history of the Supreme Court, is there any particular information or guidance you would want to give especially to girls? SO: I think women, like men, should pursue their talents and interests. I believe that it is only a matter of time before the structural barriers to women or minorities are effectively dismantled. I look forward to the day when I am thought of as the 102nd Supreme Court Justice rather than the first female Supreme Court Justice. MS: If you could instill one message in the youth of today, what would it be? What is your wish for the children of the future? SO: There is surely more than one. But I think young people might be encouraged to know that in some respects they are the teachers and we - parents and grandparents like me - are the ones who need to learn something. Today's youth have developed extraordinary tools for communicating, for gathering information, and for organizing to get things done. I hope they will become effective citizens and leaders by using these tools to make their communities, their countries, and this world a better place.